Short-run perfect binding has made great strides within our industry in recent years. Trimming duties have been carried out by traditional guillotines for many years, but this process is very time-consuming and less than ideal for the dynamic digital book publishers of today. 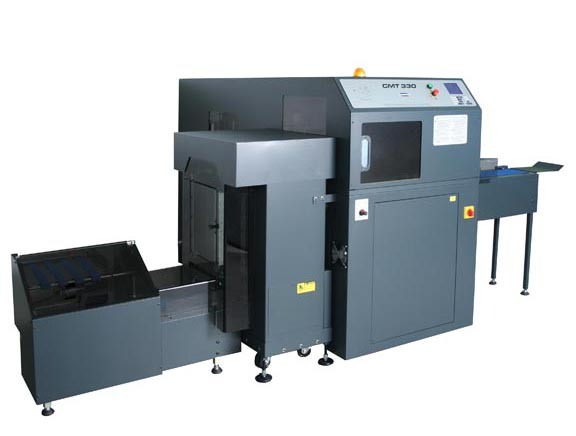 The Challenge CMT 330 three-knife trimmer brings cost-effective perfect-bound book trimming to your high-production digital book production facility. The sturdy steel and cast-iron design of the CMT 330 ensures years of trouble-free operation. Hydraulic clamping and cutting action provides strength to cut through up to 2” (50.8mm) thick books without hesitation. Standard features such as UHMW gib surfaces, composite bushings, and stepper motor technology require virtually zero maintenance. True three-knife trimming process provides consistent product quality. Simple knife change procedure cuts downtime dramatically. The industry-exclusive modularity of the CMT 330 provides added possibilities for future growth within your organization. The CMT 330 can be configured as a hand-feed off-line trimmer for cost-effective trimming. The optional high-capacity feeder permits up to 36” / 914 cm of books to be stacked and automatically fed into the trimmer. The optional vertical stacker allows up to 24” / 609 cm of books to be delivered. When these two items are combined, this near-line trimming solution permits the perfect binder operator to also feed and collect product from the CMT 330 solution. The CMT 330 can also be configured for true in-line trimming by substituting the book pile feeder with our infeed conveyor and cooling elevator. A variety of conveyors are available to interface your perfect binder with the CMT 330. The intuitive menu-driven controller allows variable mode data entry with up to 99 job storage. Swift size changes occur in approximately 20 seconds with no tools required!Machine self-diagnostics and error indication walk the operator through any difficulties. Third party control via serial communications allows integration of bar code readers/size change apparatus. Proudly manufactured in the USA, the CMT 330 provides consistent cut quality, durability, and industry-exclusive modularity that you have come to expect from Challenge products. The CMT 330 continues our legacy of providing… assurance you made the right decision!